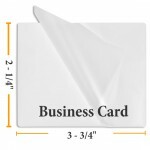 Make your own id cards and badges for events, office, school and more with our full line of id laminating accessories. We sell id card laminator machines, lanyards, badge clips and a variety of pouch sizes to fit your id making needs. Shop for lanyards for school, office or events. Lanyards are used for displaying id, credentials, access information as well as keys. There are many ways to attach and display your id badge and we carry a variety of options perfect for school, office or event. Approx. 38" length. Box of 50 Neck Lanyards. Choose your color. Approx. 36" length. 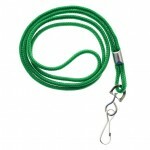 Comes with 50 Black Neck Lanyards. 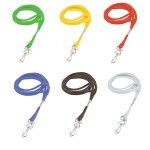 Box of 100 Mylar Badge Clips for attaching passes, id tags and name badges to clothing or lanyard. Rugged plastic luggage tag loops. 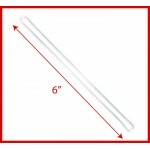 Available Slotted or Unslotted Measures: 3" x 4" (Holds 2 1/2" x 3 1/3" card) Top loads on short side. This half moon or half circle punching equipment by Akiles is compact and easy to use! Punches 1/2" x 1/8" oblong holes. 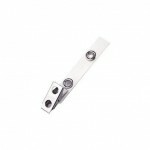 Slot punches work well for luggage tags, ID cards, security badges, business cards, and other laminated documents. 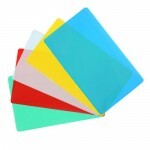 100 Color Back Military Size Lamination Pouches Pouch Measures: 2-5/8" x 3 7/8"Available in 10 mil thicknesses.Color Back. Clear Front. Available in Red, Blue, Yellow or Green.